If you’re first starting out, you may be confused by all the various options out there for indicators. Brand aside, you may wonder which style to get, and of that, which base would work well with your needs. Well, let us first recommend that you stay away from the Chinese and Indian imports. We once purchased a lot of 5 mag bases from the Enco catalog in their outlet. Thinking that magnets were magnets, we were quickly let down. We ordered the switched magnetic base, but even then, the push on/off button style was too sticky to use effectively. On top of that, the magnet couldn’t be mounted on its side. There just wasn’t enough pull. On top of that, we also ordered an import dial test indicator (the small one with the little reversible probe). It had a resolution of 0.0005″ (don’t know if it really was that accurate). The fit and finish was rough. Within one month, the back plate came loose. With something that small, you want precision components that fit well and at least exude quality. Measuring something with a device of questionable quality is bad practice. Side note: Then one day the Enco catalog had a special on SPI digital calipers. Two for under $100. Score! We picked up a pair. Better than the Harbor Freight calipers, but not by much. Now they are used as scribes. The readouts skipped, wouldn’t hold readings. Now sold on spending money on quality measurement tools, we picked up a Mitutoyo SP67 digital caliper for roughly $150. Ouch! But the moment you lay your hands on one, boy oh boy, can you tell the difference. It’s smooth, holds readings, and we paid for the SP67 which allows for some contact with liquids. Totally worth it! Back to DTIs and such. So now what? Mitutoyo, Brown and Sharpe, Starrett? Kafer? Which brand? Doesn’t really matter. They’re all good. Assume German and Japanese and truly Made in USA would do the trick. We need two indicators and a solid base from NOGA. 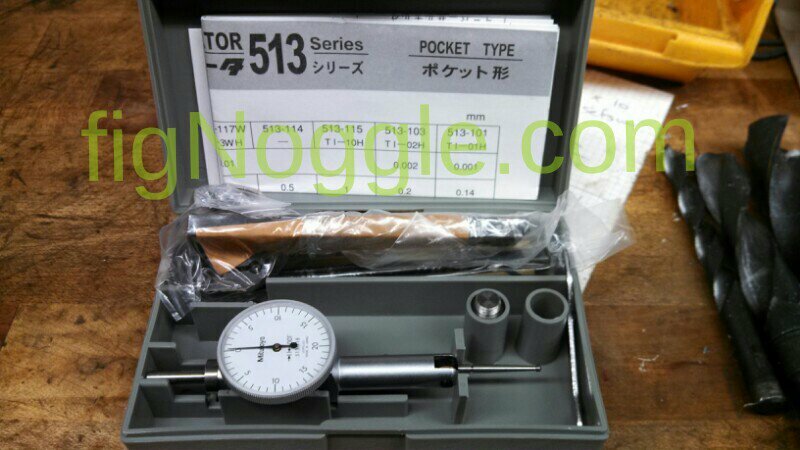 We purchased the Mitutoyo 513 series Dial Test Indicator and Drop Test Indicator. 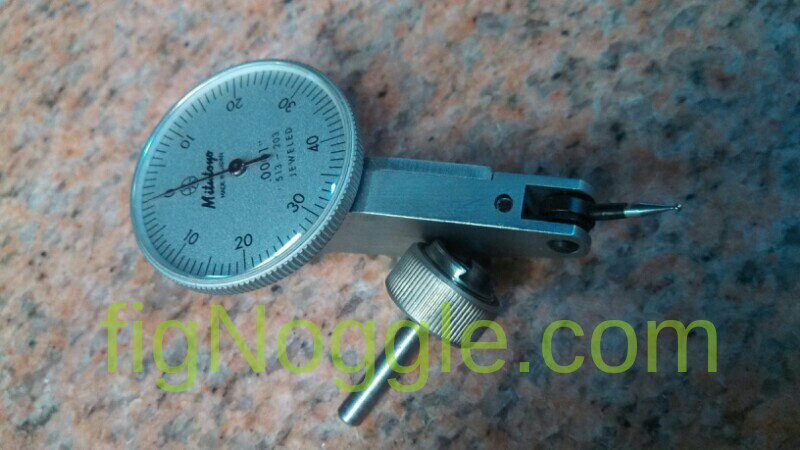 The former having the smaller interchangable probe and the latter having a larger dial face mostly for plunging movement readings with interchangeable heads. As for resolution, 0.0001″ is nice, but are we really going to indicate runout to that precision? A fun exercise indeed, but we’d be happy with 0.001″ for most of our projects. As such, the 0.0005″ is perfect. As for the drop test indicator, the 0.001″ in both a 1″ and 2″ travel will do us well. Attach either one to a NOGA base with the new style of arm articulation (single knob to tighten) and we’re good to go. The real lesson for us here is that going import from China and India is currently a bad purchase when it comes to measurement tools with movement. Sure, gage blocks and solid objects would probably work OK, but don’t spend your hard-earned retirement and hobby dollars on cheap dial test and drop indicators. Buy quality and buy it once. One of the great things about trade shows is that you can see new products and services new to you and the world. If you’ve been to many metalworking trade shows you start to see the usual suspects and the usual technology masked in different annual makeovers with the use of colors and shapes. Think of the ever changing DMG Mori brand. Their newest machines now have Star Trek looking control panels and led strips that replace the boring blinking red yellow and green indicator lights. Think of it as Ferrari styling. Although their lower end Eco line does look a bit “plasticky” due to the enclosure’s use of, well, plastic. Cool look nonetheless. Fortunately their tech and machine build quality also lives up. Well, I’m sure there will be some Mazak, Okuma, and Haas owners who would challenge that sentiment. Nevertheless, it’s quite interesting to think that machining and metal working and metal fabrication is getting a facial makeover. The real makeover however is in the way we see machine tech. While 5-axis is still “out there” it’s becoming more of a conversation than just a pick up starter line at a convention after hours’ party. Having said that, we’re still taking baby steps to get there. That’s one of the reasons rotary tables and trunnion tables are available… baby steps or bandaid fixes, depending on your financial pocket depth and or your resistance to new tech but wanting and needing to stay relevant. After seeing so many 3-axis mills and VMCs and 2 axis lathes and getting tired of comparing specs like we’re building a fantasy football league or talking brand religion like we’re comparing Apple to the PC, it’s refreshing to see “lasers” at a metalworking show. No, seriously. Lasers as in laser welding and laser metal sintering for additive manufacturing. Imagine our amazement when we saw welding on a TV screen. No, it wasn’t Lincoln Electric’s training machine, it was real welding being shown on a TV monitor. Why amazing you ask? It was welding with lasers under a microscope using wire consumables the size if the smallest of micro drills. Ten thou maybe? And guess where this tech was seen? Thailand! At the 2013 Metalex show! Imagine fixing micro cracks in your injection mold or tooling and even gray casting with your torch?! Now it seems crazy to do so with anything but a very small and precise welding method that has little heat affected zone. The demonstration samples were interesting too. Copper welded to steel. Multiple layer passes building up material in a roof shingle pattern across a piece of material no bigger than a matchbook. It was a German gentleman who was in charge of this operation speaking with such enthuasiam you’d think discovered the cure for cancer. Meanwhile, sitting on a stool his Thai employee welded away face sunk into a microscope as if he was performing lab work for said cancer cure. Minds blown, we walked away through the maze of booths thinking we saw the cure for cancer until we saw a few more booths with similar demonstrations. OK. Clearly new to us and not the world. Still mind-blowing amazing to see and ponder its applicationd. Thinking that was it for us, we again walked around, now putting some distance in our strides and trying to cover the rest of the show before days’ end. Renishaw’s booth appears. Metrology is interesting but we had yet again seen enough tables and probes to last a lifetime. We turn the corner and see the words “additive manufacturing” on its wall. Really? We think to ourselves. Yes, and it was awesome to see the samples. Low porosity good resolution largish sized parts made with a click of a mouse by “lasers”. Laser metal sintering was the new offering by Renishaw. We’re starting to see 3d plastics printing machines like the homebrew MakerBot (awww cute) and RepRap (geeks unite!) machines to the Objets, 3D Systems and Stratasys (the old timers with new tech) really draw crowds where ever they have a booth. But for metal?! That’s arguably the future for prototype machines capable of making “useful” (think Austin Powers again) parts for testing and proving. While not new to us, Renishaw’s entry into the market again amazes us in that new players with deep pockets are getting into the game. That’s an indicator for us to monitor. We don’t know what the future of metalworking will look like but the bread and butter machines will still have its place. Perhaps when direct laser metal sintering (DLMS) machines end up at our local Harbor Freight store we’ll know that it’s here to stay. 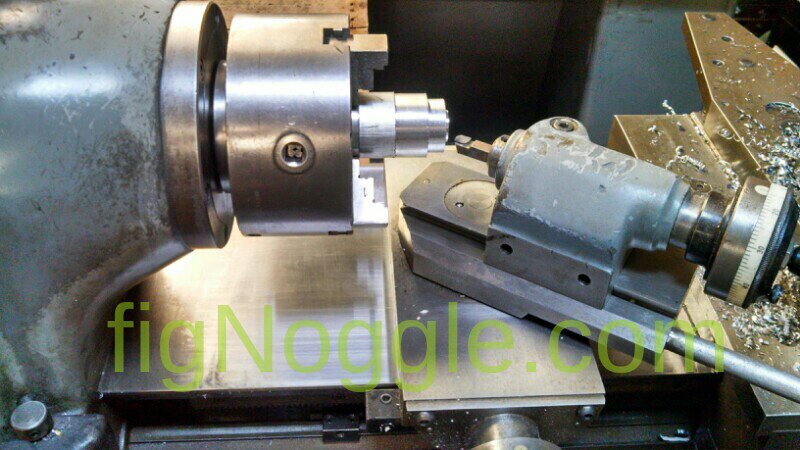 We just recently acquired a Hardinge Radius Turning Tool! We had to gamble a bit on this since there are at least two different sides to accommodate the width of the bed. Since most people don’t know the difference (like us), they only post that it’s a “Hardinge Radius Turning Tool Model #C”. But as we came to find out, there are some differences indeed. 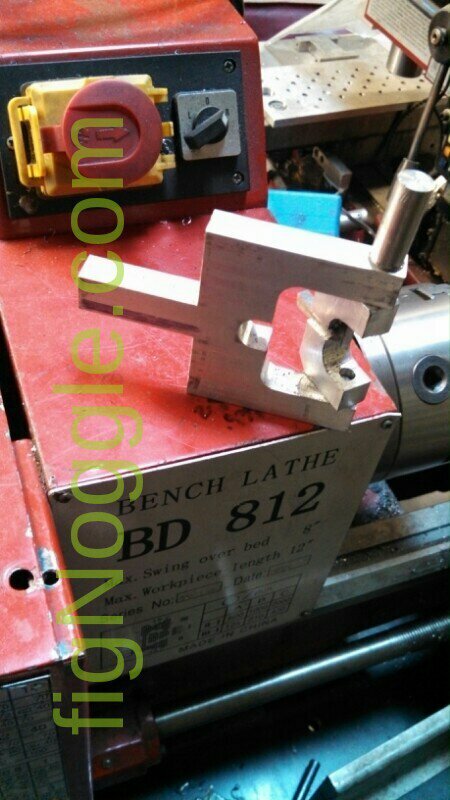 This nice gentleman scanned and posted the Hardinge D14 and L9 radius turning tool manualfor us all to peruse. We will post another article once we put this to use.